We’d love your help. Let us know what’s wrong with this preview of Lines of Defense by Stephen Dunn. In his seventeenth collection of poetry, Pulitzer Prize winner Stephen Dunn confronts the lines we fight against and the ones we draw for ourselves. Lines of Defense poignantly captures the absurdities of modern life, expectations derailed, the lived life juxtaposed to the imagined life, and the defenses we don to make do. The poems in Lines of Defense are wry and elegiac, In his seventeenth collection of poetry, Pulitzer Prize winner Stephen Dunn confronts the lines we fight against and the ones we draw for ourselves. Lines of Defense poignantly captures the absurdities of modern life, expectations derailed, the lived life juxtaposed to the imagined life, and the defenses we don to make do. The poems in Lines of Defense are wry and elegiac, precisely observed and wide-reaching. As with the best of Dunn’s work, they take stock of the quotidian aspects of life, of the essential comedy of getting through the day: finding a lost cat; not being invited to a party; taking a granddaughter to a carnival. The lines of defense are the lines of the verse itself, as poetry forms a stronghold against mortality. This essential volume showcases a poet writing at the height of his powers. To ask other readers questions about Lines of Defense, please sign up. This book made me sad because I love Stephen Dunn's poetry (in general) but was incredibly underwhelmed by these particular poems. I shouldn't have been surprised. I felt the same way about his last collection, Here and Now. I keep buying and reading his books in loyalty to the Pulitzer Prize winning Different Hours and his wonderful New and Selected 1975-1994. But I've simply got to disagree with all the plaudits on the back of the book from writers whose opinions I otherwise respect. This is a This book made me sad because I love Stephen Dunn's poetry (in general) but was incredibly underwhelmed by these particular poems. I shouldn't have been surprised. I felt the same way about his last collection, Here and Now. I keep buying and reading his books in loyalty to the Pulitzer Prize winning Different Hours and his wonderful New and Selected 1975-1994. But I've simply got to disagree with all the plaudits on the back of the book from writers whose opinions I otherwise respect. This is absolutely NOT Dunn "at the height of his powers," that ubiquitous cliche compliment which seems to ALWAYS wind up on the back of great poets' very average late books. Billy Collins says that these poems prove that "telling" CAN be better than "showing." Maybe it can, but not in this case. Dunn tells away so many emotional ambiguities he used to work hard to surprise us with. It's incredibly disappointing. Normally, in writing reviews for poetry books, I like to quote a few lines which struck me. Honestly, I can't imagine ever picking up this collection again, and here isn't ONE poem which made my breath catch or had me running for Post-It flags and a pencil. There are no high speed chases or car crashes in Stephen Dunn's books. Well… maybe there are somewhere way back there, and I just can't remember. Anyway, Stephen Dunn is in my Top 3 American poets at the moment. And the only reason I gave "Lines of Defense" 4 stars is that his last book killed me so dead, I'm not sure how to reference all other collections of poetry in comparison anymore. I loved this book. Let's say that. And the poem "For My Son" on page 66 is a new mantra for me. Well… and the There are no high speed chases or car crashes in Stephen Dunn's books. Well… maybe there are somewhere way back there, and I just can't remember. Anyway, Stephen Dunn is in my Top 3 American poets at the moment. And the only reason I gave "Lines of Defense" 4 stars is that his last book killed me so dead, I'm not sure how to reference all other collections of poetry in comparison anymore. I loved this book. Let's say that. And the poem "For My Son" on page 66 is a new mantra for me. Well… and then… there's also the last three poems in the book. Holy Crap. "In Another Country" and "Sea Level"… try those on for size. I thank Stephen Dunn for bringing it to the table. Giving contemporary poetry some dignity and credibility. And when he comes out with his next book, I'll buy it without thumbing through it first. He is the only poet I buy in hardback. Period. Dunn, while not exactly a subtle poet, is, I think, turning down the volume a little bit. These poems still are backed by the same strong voice - the one with a touch of booze in the breath - but, these poems are asking to be read a little more carefully. And if you would care to read one or two a few times over, you might even find some depth here that the more famous knock-you-down-with-a-brick collections that preceded it may not have had. This is a strong book of poems, more heavy on allegory than I expect of Dunn, and perhaps a bit more willingness to stray toward sentimentality. It's good to see one of our finest poets still willing to risk straying from what he does do well, whether successful or not. And for the most part these poems are keepers, their lines memorable, their music clear, their wisdom often sphinx-like. Stephen Dunn is one of our most reliable poets...17 poetry collections so far and such a distinctive poetic voice. Lines of Defense has that same amazing consistency and high quality. Perhaps not quite as engaging as 2013's Here and Now, but Dunn remains as thought-provoking as ever. Marriage, old and new, remains a muse for him in poems like "Anniversary Poem" (obviously) and "For My Son." Death also looms in Dunn's mind throughout the collection. Thankfully, Dunn is also concerned with other issues beyond love and death. As he insists at the end of Lines of Defense's final poem: "I love the truth, / I swear I do." "The Country of the Next Thing"
"Anniv Perhaps not quite as engaging as 2013's Here and Now, but Dunn remains as thought-provoking as ever. Marriage, old and new, remains a muse for him in poems like "Anniversary Poem" (obviously) and "For My Son." Death also looms in Dunn's mind throughout the collection. Thankfully, Dunn is also concerned with other issues beyond love and death. As he insists at the end of Lines of Defense's final poem: "I love the truth, / I swear I do." 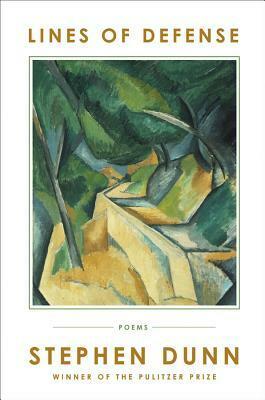 "Formalities for the Long Road"
"Letter to the Man I Once Was"
Between the not it, and the not-quite-not-it, lie Stephen Dunn's recent poems, his fifteenth book, perhaps more to the side of the latter, which he will mind not at all. The not it has the grace to be a wrong road headed in the right direction; Dunn's poems occupy a larger space, which I among many tenant, and have, in my case, since 1981, when first I read Dunn's great poem, "Coming Home, Garden State Parkway," from Full of Lust and Good Usage (1976), a poem thematically similar to the poems in Between the not it, and the not-quite-not-it, lie Stephen Dunn's recent poems, his fifteenth book, perhaps more to the side of the latter, which he will mind not at all. The not it has the grace to be a wrong road headed in the right direction; Dunn's poems occupy a larger space, which I among many tenant, and have, in my case, since 1981, when first I read Dunn's great poem, "Coming Home, Garden State Parkway," from Full of Lust and Good Usage (1976), a poem thematically similar to the poems in this collection, a collection of retrospection, reflections by a considerable man of worldly achievement and Roth's American pastoral, which is William Carlos Williams' pastoral, too, on a life, as well as the themes of his most brilliant poetry, among which that poem, and that volume, will be cited. A Swede. A basketball player, an ad-man, and a gambler. A shrewd and worldly narrational "speaker." His Berrymanesque gambits never ventured. But with Berryman's consul, viz. Stevens ("that he does not wound") much on his mind. I went away from Dunn, having immersed myself in him while even Dunn was still young, imitated him etc., but then I got pretty quickly that he would not pass Berryman's test. Now, writing an elegy about Donald Justice, Dunn's "counter-mutter" can't stay away from Justice's "rich refusals -- what you [Justice] held back, | no doubt out of respect for us." There's a Berrymanesque cadence in the elegy for Justice, a bit of verse caricature: "Oh you were a charming, difficult man." Dunn was with Justice (and George P. Elliott, and John Cage) at Syracuse, early to mid-Sixties. Dunn had been to Spain for a time. Came home, got his MFA, started teaching in New Jersey; it's the poems of this early Seventies period that I continue to find difficult to shake. The discourse which began long ago in Circus of Needs and reached its epitome in Between Angels and the sublime Pulitzer Prize winning Different Hours continues here in Stephen Dunn's Lines of Defense. The wry voice teasing out mindscapes now sounds an elegiac note and often muses on--of all things--real earned happiness, but it is still as satisfying as a partner in inner conversation as it always has been. I wonder how often reading a book or poetry is about your personal narrative as read. I have found a hat this poetry struck a nerve that was needed to be fine-tuned. More importantly, there were a couple of poems that just resonated with the the trivial aspects of life while still managing capture and contemplate many of the absurd moments of today. Pulitzer Prize winner, Stephen Dunn, presents a slim volume of readable poems about daily life in an honest seemingly plain manner. Many poems are about youth, but some concern later adult problems such as divorce. But for the wonderful poem "Pedagogical" I would've given this 2 stars. 2.5 stars. Just couldn't get into his poetry. There were a few poems I did like, but I think I'm out of practice in reading poetry. Beautiful new collection of Dunne's work. Perhaps nothing will ever top "Loves" for me, but this comes close. Spectacular... Cannot wait to reread it again. Stephen Dunn was born in New York City in 1939. He earned a B.A. in history and English from Hofstra University, attended the New School Writing Workshops, and finished his M.A. in creative writing at Syracuse University. Dunn has worked as a professional basketball player, an advertising copywriter, and an editor, as well as a professor of creative writing. Dunn's books of poetry include Everythin Stephen Dunn was born in New York City in 1939. He earned a B.A. in history and English from Hofstra University, attended the New School Writing Workshops, and finished his M.A. in creative writing at Syracuse University. Dunn has worked as a professional basketball player, an advertising copywriter, and an editor, as well as a professor of creative writing. Dunn's books of poetry include Everything Else in the World (W. W. Norton, 2006); Local Visitations (2003); Different Hours (2000), winner of the 2001 Pulitzer Prize winner for poetry; Loosestrife (1996); New and Selected Poems: 1974-1994 (1994); Landscape at the End of the Century (1991); Between Angels (1989); Local Time (1986), winner of the National Poetry Series; Not Dancing (1984); Work & Love (1981); A Circus of Needs (1978); Full of Lust and Good Usage (1976); and Looking For Holes In the Ceiling 1974. He is also the author of Walking Light: Memoirs and Essays on Poetry (BOA Editions, 2001), and Riffs & Reciprocities: Prose Pairs (1998).